A skid is where your vehicle’s tyres lose traction on the road surface and it can be caused by too much acceleration, too much braking or too much turning force for the road surface. Some of the advice you will hear about skidding is now out-of-date because modern vehicle technologies such as anti-lock brakes (ABS), electronic stability control (ESC [also called electronic stability program]), and traction control will work to prevent you from skidding. Let’s take a look at how each type of skid is caused and what you can do to prevent it. Remember, if you want to try skids, your local race track will run track days and often there are specific drift training days. Oversteer is when the rear wheels of the vehicle break traction and the front wheels don’t. The wheels will slide towards the outside of the curve. There are two types of oversteer: lift-off oversteer and power oversteer. Power oversteer is where the driver applies too much acceleration and the turning force of the wheels overcomes the friction of the road surface and the wheels spin. Once they are spinning they have much less lateral (sideways) grip and therefore slide sideways. This is the technique used in drifting to achieve big, smokey powerslides. Only rear-wheel drive cars can perform power oversteer. Lift-off oversteer (also known as trailing-throttle oversteer and snap oversteer) is where you are already turning and you do something to the car like take your foot off the throttle, or brake, or change down a gear which puts more weight over the front of the car, and reduces the weight over the back of the car. The balance will be upset – there is a weight transfer forward which slightly increases the turning becomes tighter and that means less grip on the rear tyres, causing a skid. This type of oversteer is much more pronounced in rear-engine and mid-engine cars such as a Porsche 911 or a Toyota MR2. This is because there is a solid lump of metal (the engine) at the rear that can act like a pendulum. Both rear-wheel drive and front-wheel drive cars can suffer from lift-off oversteer. In a motorbike, oversteer can cause a highside or lowside crash – check this article for videos. On a truck, if the rear wheels of the tractor unit break traction, the trailer can push the truck into a jackknife. Understeer is where you turn into a corner but the front wheels slide sideways meaning the car travels forwards rather than turning. Almost all cars are set up to understeer as it’s the easiest type of skid to correct and the least dangerous. Understeer is caused by either turning into a corner too fast or applying too much power as you exit the corner. Power understeer can be rectified by taking your foot off the throttle. This video explains how to recover from understeer where it’s because you enter a corner too fast. And this video shows how it can all go wrong even for professional drivers. In a motorbike, understeer is most likely to cause a lowside crash – check this article for videos. Hydroplaning, also called aquaplaning, is when your tyres rise up on top of a layer of water because the tread in your tyres can’t disperse the water fast enough. The shallower the tread on your tyres the more likely you are to hydroplane. This video explains how your tyres disperse water and what happens if your car does lose traction. It also gives an explanation of why you shouldn’t use cruise control in the rain, which we covered here. Wheelspin is where the driver applies too much throttle and the torque (turning force) of the wheels overcomes the grip available from the road surface. You most commonly see this on a drag racing track where drivers use it to warm up their tyres. Modern traction control systems don’t let the wheels spin. To stop the wheels spinning, lift off the throttle. Wheelspin when going around a corner will result in understeer in a front-wheel drive car and oversteer in a rear-wheel drive car. A skid is caused by applying too much braking force when you don’t have anti-lock brakes. The wheels simply lock and slide across the top of the road surface. 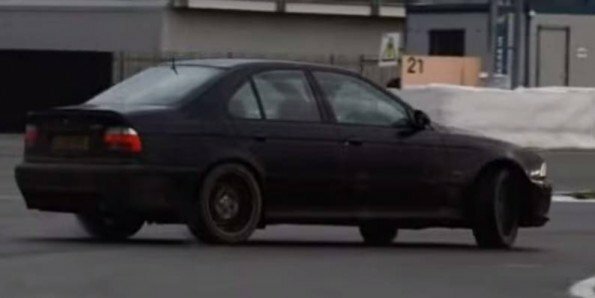 This video explains anti-lock braking.